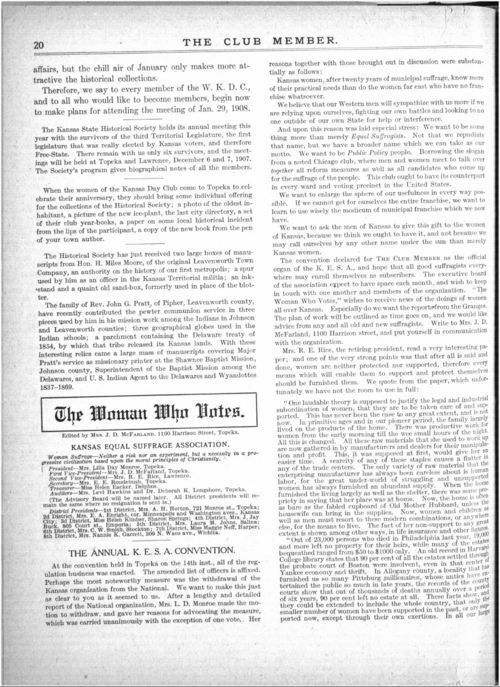 This article discusses the most recent meeting of the Kansas Equal Suffrage Association, held in Topeka. The main business conducted at the meeting was discussion about whether or not the Kansas chapter should withdraw from the national association. Lila Day Monroe, president of the K.E.S.A., offered her reasons for supporting this withdrawal. Her resolutions explain the goals of the K.E.S.A. and are intended to inform readers of The Club Member about this very important decision. The vote on the measure was almost unanimously in favor of withdrawal. The article also notes that at this meeting the organization voted to make The Club Member their official magazine. This article is particularly useful because it explains the goals of the K.E.S.A. and outlines for students the arguments that suffragists made to support their position.